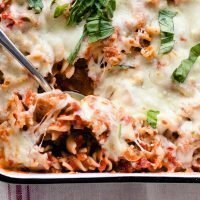 Chicken Parm Baked Pasta – Deconstructed chicken parmesan made with chicken tenders, pasta, sauce, and lots of cheese. It’s easy, cheap, and delicious! Kyle and I agree about lots of things. Paint colors. Home decor. The insanity that will be our garden this year. Sometimes I wonder if he’s really just yes-ing me to death. But either way, it makes for an easy marriage so I don’t complain. Making it a little easier is our agreement on the fact that chicken parm may just be the most perfect meal on earth. It was always, always, always my birthday meal of choice growing up. So you could imagine how completely smitten I was the first time I heard him order this off a menu at dinner back in our early dating days. 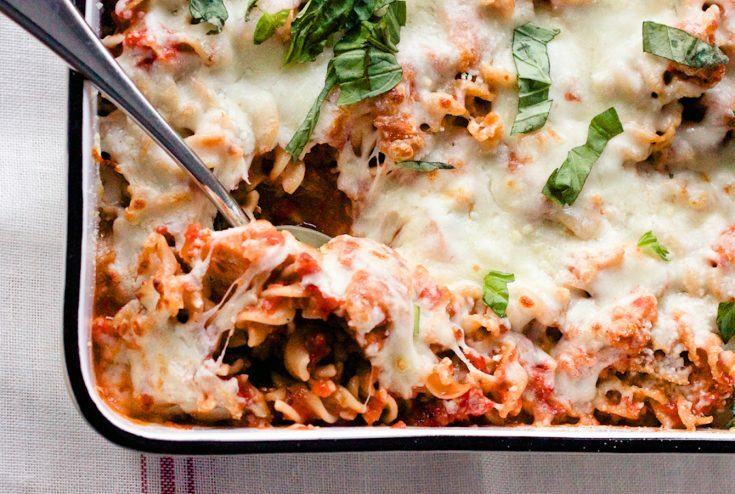 And it should be no surprise how much we both loved this chicken parm baked pasta. It’s a deconstructed version of our favorite meal, is quick to throw together, and it will continue to make the rounds on our menu for ages to come – I’m quite sure of it. Sooo simple to make, you’ll boil the pasta in a quick homemade tomato sauce, just like this one-pot creamy sausage pasta (major winner around here! ), and then toss in some cheese and chicken before topping with more mozzarella cheese – it IS chicken parm, after all! – and baking until bubbly and delicious. 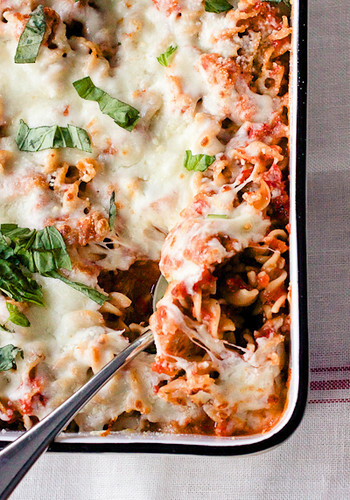 How could you possibly go wrong with this chicken parm baked pasta?! Housekeeping Note: Don’t forget to check out our new kitchen design and vote on Sub-Zero & Wolf’s Kitchen Design Contest for a chance to win a $100 Visa gift card – all entry info can be found right here on the blog. P.S. – We have the same counter stools as in the photo with the big wood beam header between the doors! This meal is like making deconstructed chicken parmesan! It's made with chicken tenders, pasta, sauce, and lots of cheese. And it's easy, cheap, and delicious! 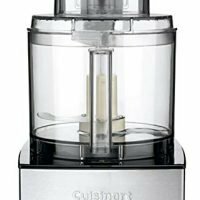 Puree the tomatoes and their juices in a food processor until finely pureed. Heat the oil in a large skillet over medium heat and cook the garlic, oregano, and red pepper flakes until fragrant, about 1 minute. Stir in the tomato puree, water, broth, and pasta. Season with salt and pepper. Bring the mixture to a simmer over medium-high heat and cook, covered and stirring often, until the pasta is cooked through 15 to 18 minutes. Stir ¾ cup of the Parmesan and the chicken into the mixture. 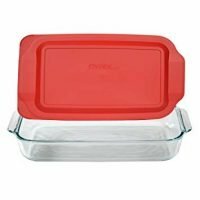 Transfer the mixture to a 13×9-inch baking dish. Sprinkle the mozzarella and remaining ¼ cup Parmesan over the top. Bake for 10 to 15 minutes, until the cheese is melted and bubbly. Sprinkle the chopped basil over the top of the dish before serving. 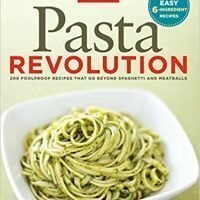 If you want to make this a completely one-pot meal, be sure to use a skillet that is oven-safe to at least 475° F to cook the pasta and sauce on the stove top. Cast iron, enameled cast iron, or stainless cookware would be perfect for this. Then, in Step 5, skip transferring the mixture to a baking dish and proceed with the recipe in the skillet. This is one of our favorite quick and easy weeknight meals! Love that you tried it with whole wheat pasta, I haven’t done that yet. 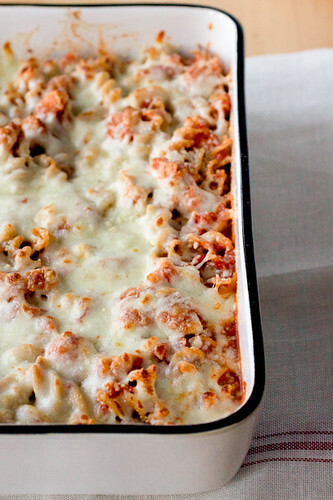 Chicken parm in a pasta bake?! Yes, please! Love it! I made this and if was so good, and easy to make. It was even better the next day! I agree – definitely better the next day!